After our big success at the NEC Classic Car Show in November, we will be once again travelling to the Techno Classica in Essen - the biggest Car Show in Europe. The show gives us an opportunity to meet up with our European members and always proves very enjoyable. It is a 5 day show so will mean a lot of time and hard work for those willing to attend with their cars and also to man the stand. Ray and I will be travelling in the van to transport all the equipment and will be going with the intention of matching the success we achieved at the NEC and going for a themed stand. Whether we repeat the Mafia theme or go with an idea thought of at the last show has yet to be decided but a new theme seems favourite. If anyone would like the opportunity to display their car at the show please contact me as soon as possible we need your support both with cars and for manning the stand. If you have a J72 , Kallista or Lima and want to display please approach us. We will be representing both the Club and the Panther Marque so let’s do it in style at this very prestigious event. Those travelling from the UK will be travelling on Monday 19th March and returning on Monday the 26th March allowing plenty of time for travel and setting the stand for the 5 day event and on arrival being joined by Roland & Geli and hopefully other volunteers once in Essen. We will be staying at the KCH Hotel Astoria which is just one train ride away from Messe Essen. It is a nice hotel and they welcome us back each year. If you would like to visit the show and want to stay at the hotel for a few nights please get in touch so we can book the rooms. I hope all our European members have this date in there diary as its one opportunity I get to meet you all. I will have plenty of Panther regalia with me but if you need anything special or any parts I am sure we can squeeze them on the van. I look forward to meeting many of you there. I’m holding the last ever ‘Workshop Day’ at my garage premises on Saturday 7th. April. Although it’s in Area 12 the workshop is open to all members. I just need to know who’s coming for catering purposes. It will start at 9.00am and finish at 4.0pm. Finch Foundry, Sticklepath. Saturday 14th. April. Meet at Little Chef. Sourton Cross for 10.00am. There’s a good pub (the Taw River) across the road where we had an excellent cream tea after going to the RHS at Ringmoor. We have reserved rooms at the Llyndir Hall Hotel for the weekend for our season opener. The special rate is £60.00 pppn. for Dinner, Bed and Breakfast. All members are welcome to join us, but please book early. The hotel is just off the A483 midway between Chester and Wrexham. Ring the hotel direct on 01244 571648. For more info call Peter Heighway on 01614319680. “Drive it in Cornwall” invites all motoring enthusiasts to join us for a pleasant day out in the highways and byways of our delightful county. All entrants will be given a route book which details the day’s driving and which takes in some of the wonderful scenery and back lanes which our county has in abundance. Our route of approximately 90 miles will include drives through private estates on roads not normally open to members of the public, and there will be a chance for a light lunch and a cream tea in one of Cornwall’s beautiful private gardens. This is the first year that the event will be taking place and to help the organisers we are asking for Rotarians within District 1290 to pre-register their interest in taking part. Whilst we will be delighted to see classic and older vehicles on this event, there is no restriction (except the width of some of the lanes!) on what type or age of car or other vehicle you enter. If you have friends who are non-Rotarians, they are also welcome. To be honest, I’ll take any entrant with a cheque book! Please download the form and send it in if you are going. Let me know as well. Steven Horne has replied Ref.Drive Cornwall. We enter individually, state we are members of the PCC and he will link us all together. Seems they are looking forward to having us come along. 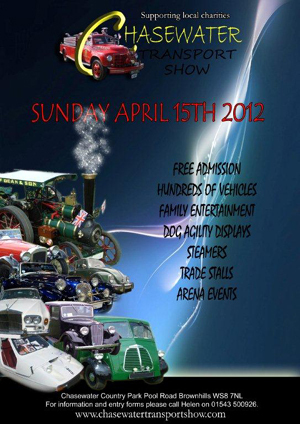 The car show is on 12th may 2012 (WEEK EARLIER THAN USUAL). As usual gates open at 8am for anyone showing and 10am-2pm for public, becoming very popular so need numbers asap. Area 4, Berks, Bucks & Oxon, Panther Car Club, has arranged its first meeting locally on May 25 2012 at the Harte & Magpies Pub, Coleshill, near Amersham at 6.30 for 7.00pm. All are welcome. They have room for about 10 cars, in a special display area. A BBQ and a bar will be operating. Raddisson Blu Balmoral Hotel. Then on to the Leiwen Germany for four nights staying at the Hotel Zummethof when after four nights we will travel on to France to stay for two nights at the fortified castle of Sedan the Hotel Le Chateau Fort before leaving for our final destination in the champagne region close to Laon, Rheims and Soissons the hotel will be announced soon as we still await confirmation, but details will be made available as soon as it is confirmed. The full itinerary will be published both on the website and on the forum where cost and booking forms will be made available also featured in thre February Magazine. Early booking is advisable as rooms at hotels will be limited and Steve and his team are doing a grand job in negotiating and putting the itinerary together . If you are interested in joining us and would like me to email you further details as they become available please drop me an email or give me a call. The price £799 per person this includes Ferry crossing Hotel BB&D ,wine tasting in Germany and live music in the hotel in Germany on one evening .. Driving round the circuit at Spa is still an option which has not been included in the price details to follow as the track has been hired out for the day but we are hoping to be allowed to use it at a fee..
2012 celebrates 40years of the first production of Panthers so it seemed appropriate to travel to Europe and visit 4 different regions one for every 10 years since production. Please contact if you have any queries and I will do my best to answer them. If you need any more info e-mail Mick and Terry Laplain on laplain-at-btinternet.com or phone 01371 872002. The Tamar Valley MG Owners Club takes pleasure in inviting you to the “PEOPLE& PLACES RUN” to be held on Sunday 10th June 2012 starting from National Trust, Saltram House, Plympton (car park, just follow the signs) Although not essential, it may prove useful to have Ordnance Survey Landranger Map 201 to hand in order to get an overview of the route, which is approximately 80 miles. I have once again booked a special club display stand which enables us to show 15 cars at the show in Norman Park. If anyone would like to attend this large show and be part of the Panther car club display, then you will need to book in with me. The Bromley Pageant of Motoring show is divided in to many areas including club stands, autojumble, arena events, military vehicles, motorcycles and the popular one make parking. In all there are over 3000 vehicles on display. Once again we will have the tea tent will be in action. At 1.00pm we will be having the popular bring a dish buffet lunch all together. If you would like to be part of this great event the discounted tickets cost £5.00 for car, driver and one passenger it also includes programme & plaque. Gawsworth Hall Classic Car Rally, Gawsworth near Macclesfield. The Gawsworth Classic Car Show has been postponed to Saturday 16 June because of the bad weather we have been having. Devons’ Dartmoor. Picnic lunch and a cream tea cruise. Meet in the car park behind the High Moorland Visitor Centre, Princetown for 10.30. Route is being devised. Contact Andy Graves if going as lunch (if picnic not preferred) and cream tea has to be reserved. Dartmoor Drive is now devised. We leave Princetown for a wiggly run to Widecombe-in-the-Moor for lunch. I’ve reserved places in the Old Inn for lunch. We then go on another wiggle via Ashburton, Vennford reservoir and Hexworthy to Brimpt’s Farm for a proper Devon cream tea. They’ve have asked me to confirm final numbers on the morning. This is an any weather trip, the moor can be just as interesting on a damp day – dodging sheep laying on the road. I’ve done a recce run of the route for next Sunday. The drive (from Princetown) is about 16 miles each half - 32 miles in total or hour’nhalf. Bring your cameras as some of the views are really good and we’ll stop to take photos. The drive finishes at Brimpts Farm where we are booked in for a cream tea. From here one can return to the A38 or head back to Princetown. Look forward to seeing as many as can make it. The forecast is good. There is a reserved a club space for Panther’s at this show which takes place along the front overlooking the sea, so if you are interested in coming along then please get in touch and I will arrange for an entry sticker to be sent to you. Please contact Geoff Coad on 01689 852250. THERE IS NO NEED FOR YOU TO BOOK YOUR CAR IN. But you MUST let me know ASAP if you are going to attend. So please get in touch with me on 01689 852250 if you are interested in coming along. The cost is £3 per car with all money going to charity and so far the show has raised £64666 for the Kent Air Ambulance and other Charities. Have invited us to bring our Panthers to their BBQ event where they ask all different car clubs to attend they are hoping for around 200 cars. Please contact Tony Ansell 01227 374080 Panther Car Club for more information and if you are planning to attend. Wheels 2012, this year being held on July 15th at The Royal Cornwall Showground Cornwall. Please contact Ray and Sue Smith to let them know you are going. Sporting Bears Show at Kimbolton Castle / Cancelled!!!!! The annual Sporting Bears event at Kimbolton Castle takes place on the 15th July 2012. Nigel Plunkett has once again booked 40 places in the hope that you will all support this very popular fundraising event. Please contact Nigel to obtain and entry ticket which is necessary to gain access, £8 per car is charged on entry to the event. Please be sure to give your address so that your ticket can be posted to you AND as in previous years try to arrive before 9:30 to avoid the queues to get in. I have just been informed that Kimbolton 2012 has been cancelled for this year by the Sporting Bears and Kimbolton School, as the ground is heavily waterlogged after the recent bad weather. I will be contacting those people who have already received tickets from me. The Ninth Elvetham Heath Car Show will be held on July 15th, 2012. The show has been organised to provide a great day out for all the family to see the finest motorcars on offer, from the latest Dealership models, Rallying, BTCC, Prestige, and Race prepared, to the finest examples of historic sports cars. Family entertainment including Fairground rides, candy floss, burgers, hotdogs, beer tent, Golf challenges, etc, etc. This is a non profit event and free to enter, to the public. Monies are raised by selling pitches on the field and by commercial organisations donating raffle prizes. The monies raised will be split between the Chase Children’s Hospice, Phyllis Tuckwell Hospice – and local charities. To date the previous eight events have raised approx £30,000 for charity. Over the past eight years we have been experiencing average public attendance of over 2000 people. If you haven't already confirmed your attendance please get in contact so we can plan the field. We have planned some good weather this year and expect to see some of the aircraft from Farnborough Air Show fly over. Here is the web link for the meeting venue. It is easy to get to. Take the Reading exit number 12 on the M4. Follow the A4 towards Reading and turn right at the traffic lights into Bughfield Road after 3+miles. As soon as you go over the canal bridge the turn into the pub comes up immediately on the right. Sunday lunch is popular so I shall book a table for 1230. I am writing to invite you and the Panther Classic Car Club to display your cars at the Classic Car Show at Stafford Castle on Sunday 29th July 2012. The modest booking fee of £2 per vehicle remains the same for 2012. A booking form is enclosed. Would you please complete and return the forms ASAP. A pass will be sent to you before the event. Display cars are required to arrive between 9.00 am and 10.00 am. The event takes place between 11.00 am and 5.00 pm. 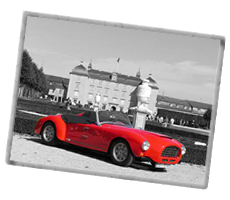 Admission to the classic car competition remains free. Application forms will be distributed to display car owners on the day. The public will be invited to vote for their favourite cars in the following categories: Pre-War; 1940s and 1950s; 1960s and 1970s. This year we will add an additional class ‘Modern Classic’ for cars 1980 to 2000. Trophies, donated by our sponsor, will be presented by the sponsor and the Mayor of Stafford on the day. Public admission to the event is free of charge with the exception of car parking which is £2 per car. Visitors can freely wander around the castle, the grounds and the Visitor Centre. Other attractions including selling stalls and refreshment will be available.We look forward to seeing you on the day. Mt Edgcumbe Annual Classic Car Show and country fair with Area 12. Contact Andy Graves for more info. The Classic Car Show will take place again on Sunday, 5th August 2012. Please visit the show website ASAP & print off a form/complete & send to the show organiser (not me!). Terry Borton ...01543278860 (local contact). Please send details with SAE by June 30th. The club visit is for the 26th. This is taking place at Pentillie Castle on the banks of the river Tamar, it’s near the St. Mellion golf course. As soon as we have the full details we’ll update this item. One of the organisers, a Panther Kallista 2.8 owner, has reserved us 10 display spaces for the Sunday. It is a first in the region and there will be plenty of media coverage. Let's do our very best to support him and the event. The show has been Cancelled!!!!!!!!!!!!!!!!!!! The show is ON! --- On the 8th.Sept. same place, same sunny side of the field. Same assembly point – Sainsbury. Marsh Mill. Keep your orange entry passes, if you’ve lost, binned or haven’t had one you can reapply. Just google Aveton Gifford and click on classic show. Woodsmoor Lane Playing fields off Woodsmoor Lane, Stockport SK3 8TJ 10am-4pm. Andy Stobbie is organising this show again, in aid of St Ann's Hospice and Tommy's baby charity. Last year we raised £1300 for these charities, please join us and help us raise more. £5 suggested donation per car. The 2012 Grand Gathering will be held at Brooklands Museum, Weybridge Surrey a fitting place to celebrate the 40th Anniversary of the first Production of Panthers. A 70s theme will run throughout the day so dig out those Flares, Hotpants and platform shoes. Rooms have been reserved at the Hilton Hotel Cobham, Weybridge Surrey and cost of the weekend package including dinner on the Friday and the Gala dinner Dance on the Saturday will be advised shortly. The AGM will be held on Sunday morning at the hotel. An activity will be arranged for Friday and Sunday after the AGM and as it the 2012 Para Olympics with events in the area at time I am sure there will be plenty going on. This is one reason why we have announced arrangements early as its imperative we get rooms booked to ensure availability. The Grand Gathering will start at 10.00am on the 1st September and Panthers will take over the whole of the front parking areas and throughout the main areas of Brooklands. The regalia tent and Bruno’s spares will be available for all your shopping needs. There is plenty to see and do at Brooklands and all those who did not rise to the challenge of the Hill climb in 2010 we have arranged for it to be made available again, for those who wish to test their skill or improve their performance. A Brooklands Certificate will be awarded if the hill is completed. This is great fun and an experience not to miss. Special trophies will be awarded for the best presented cars in each class. With Concorde on location and the opportunity to experience the flight simulator and many other aircraft, workshops plus the new Bus museum now open for you to browse it will be a great day out. Once again a photo shoot on the banking of the old track with access to the Bridge for photographs will take place. It’s hoped that with it being the 40th Anniversary and the early notification all members will make a special effort to attend joined by as many of our overseas members as possible whether they drive of fly. It will be good to see everyone. Let’s make it one to remember. For further details do not hesitate to contact me. Planung / Erklärung zur "booking form"
Saturday 15th the show will be held at Newport Quay where all monies collected will be donated directly to St Catherine’s School in Ventnor which specialises in teaching children with learning and communication difficulties. Sunday 16th the show will be at Ryde Esplanade and all monies collected will go directly to the Earl Mountbatten Hospice in Newport. Victor Gallucci, the organizer, has built this show up over the last eleven years and the 2012 show promises an even greater variety of vintage, classic, custom and retro cars, bikes and other unusual vehicles. In all, there will be in excess of 700 vehicles on display.. We have booked accommodation again at Buntshill Farm and travel is sponsored by Wightlink and we will be travelling over on the Friday and return home can be from Sunday after the show until the following Wednesday excluding Monday unless a return ticket is purchased for that day. If you would like to attend please let me know as soon as possible. Could those who have booked please confirm dates and times they would like to travel and whether from Portsmouth or Lymington. We have been attending this event for quite a few years now & each year it gets better. As per usual, I have made a group booking so if anyone is interested in going please let me know & I will send you an entry form & further details. The Association Sables d'Olonne has invited Panthers to take part in their fifth show “A NOUS LES BELLES ANGLAISES” . Only English manufactured cars of all types and age will be displayed at this event . 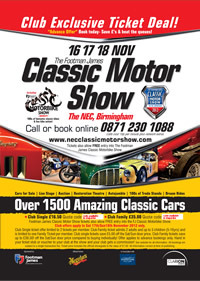 NEC Birmingham is on the 16th -17th 18th November 2012. We are in Hall 18 Stand C145 . Further information to come on our website , Forum and in the next magazine. Ilona & Günter laden "alle" Panthereigner zur PANTHERCLAUSFEIER 2012 herzlich ein! Um Anmeldung wird gebeten!!! / Please register for this event. / Merci de vous inscrire pour cet événement. 6th December Area 1 Christmas dinner will be held on the 6th December at the shy horse chessington, this is our usual club meeting night, a full festive menu is available [see attachment] if you would like to come please let me know ASAP,and if you want the Christmas menu let me know your choice,s many thanks Bruce. It’s at the Arundel Arms Lifton and the table is booked from 12.30pm. A menu will be sent out later for you to choose, if possible, your preferences. We have been offered the private dining room were we can converse (and throw bread rolls?). Those of you who don’t want to drive there and back in a day can book in for the Saturday evening – ring 01566 784666 to book in. dinner bed and breakfast is very good, ask Geoff Booth, but not cheap. This is the Christmas Menu (>>> more), please make your selections in time and phone it directly to the Arundel Arms. Their phone number is 01566 784666. don’t forget to say it’s for the Panther Car Club Xmas Lunch. Make a note of your selection and take it on the day – just in case you can’t remember what you ordered. They have given us the private dining room as there is another group in the main dining room. This Lunch will also be instead of our usual Friday meeting. Please forward your selection to him asap and he will liaise with the Arundel Arms. It seems they were not able to receive menu requirements from individual members as they phoned in. They would like all menu orders in ten days before the day. Geoff will do it all in one go - as before please keep a list of what you ordered and take it with you.